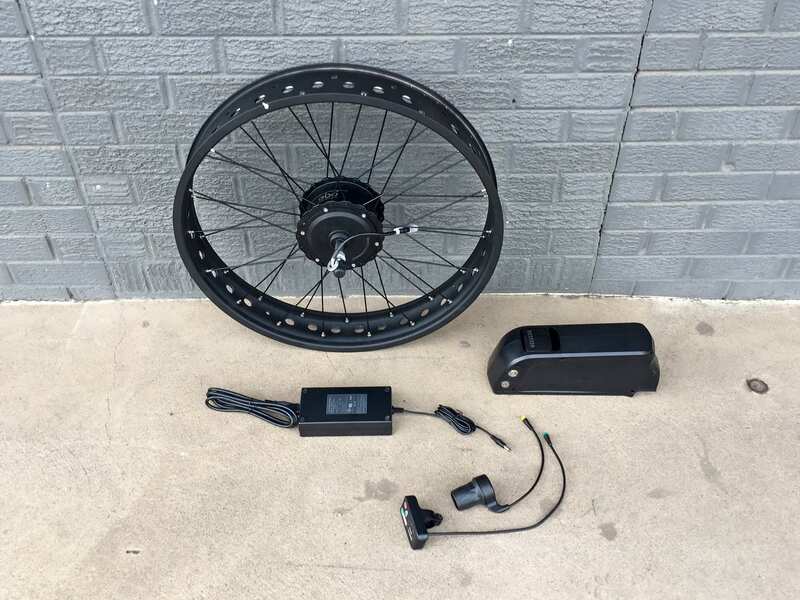 Warning, in some configurations this electric bike kit is classified as a moped or motorcycle and may not be ridden on cycling trails or paths. It may require licensing, insurance and lights when used on public roads. 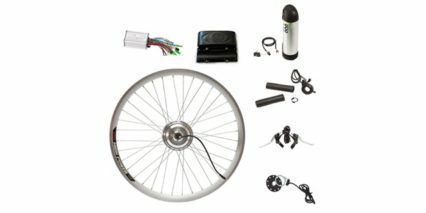 Electric Bike Outfitters (EBO) has been making retrofit electric bike kits in Denver, Colorado, since 2015. 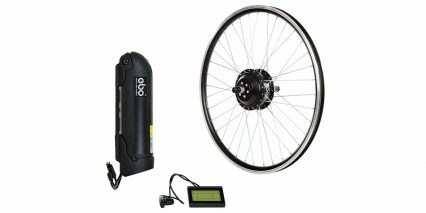 EBO kits are becoming available in many bike shops now and, for those who can’t find their products in a shop, they offer worldwide shipping. I met Jason Livingston, the founder, in the early days when we reviewed some of his first products and he struck me as a relaxed and honest guy. 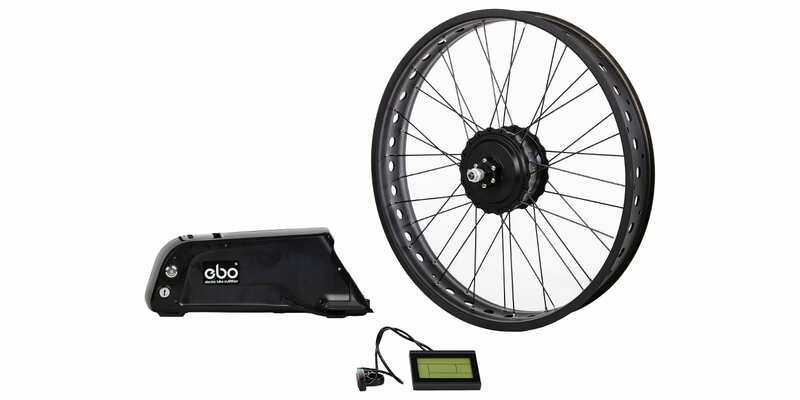 EBO kits may have some limitations, but their 30-day return policy and one-year warranty are reassuring for a product that tends to be priced lower and can be more prone to complications than complete electric bikes. Those complications are minimal, especially compared to a lot of the more generic kits out there, and EBO goes out of their way to make custom accommodations for their customers’ individual needs. 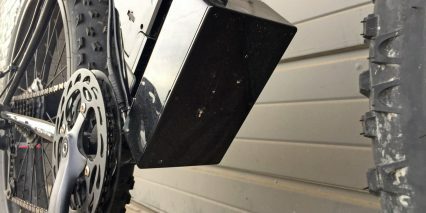 For example, they will create cables that are longer than normal so you can mount your display, battery, and throttle in the best possible location on your bike. They offer two battery sizes, two display types, and they even build custom wheels. 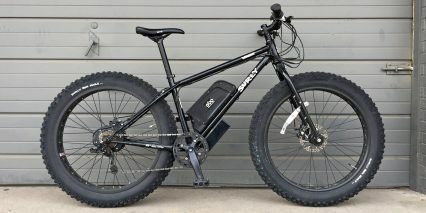 Their latest product, the EBO Fat Tire kit, is designed and built specifically for use with fat tire bikes. 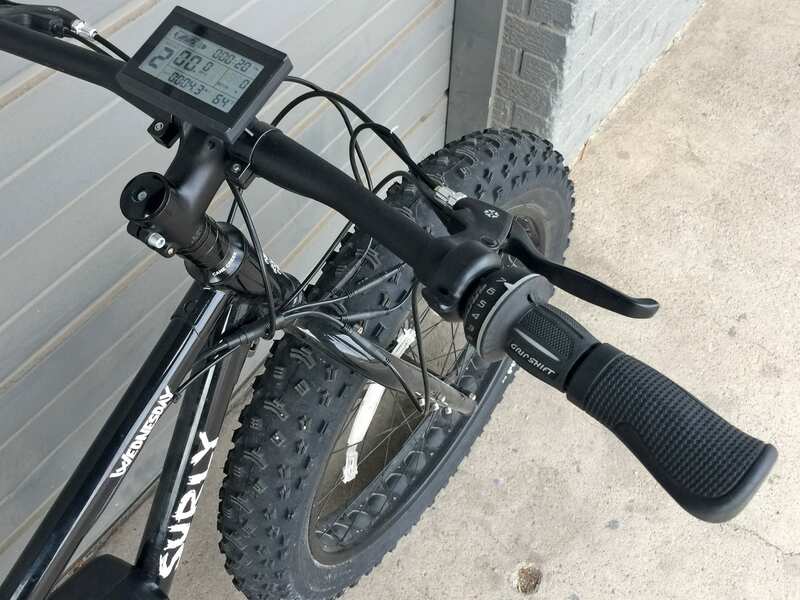 It’s unique in that way, there don’t seem to be a lot of fat bike ebike conversion kits out there in general and this one offers above-average speed with smooth throttle operation. This kit has some serious power and is more than capable of taking on snow, sand, and other soft terrain if tire pressure is set accordingly (I usually lower to ~6 PSI for soft sand). In the video review above, you can see how the throttle can be useful for pushing bikes up. The review location was more of an urban environment, but I plowed through a couple of snow piles and I feel like this bike would be a great option for hunting, expedition biking, or even bikepacking, although the kit does add about 20 pounds of weight to your bike. Even so, the motor is powerful enough that it might enable you to get out of tricky areas without having to carry your bike, you can always hop off and push with the throttle as I did to climb the stairs. 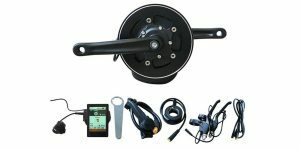 This kit comes with a very nice 30 amp controller, although it has to be mounted separately, and it offers one of the most powerful motors out there with a maximum output of 1440 watts and 80 Newton meters of torque. It comes with a black aluminum alloy, double walled, 36 hole rim and extra thick 12 gauge spokes. It is available in 24 inch and 26 inch wheel sizes and they work with both 4 inch and 4.9 inch fat tire sizes. You can choose from trigger throttle, half-twist, or full-twist for more of a motorcycle feel if you wish. 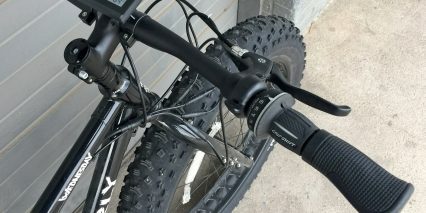 I usually opt for trigger throttle when riding off-road in order to keep the grips steady for steering. You get mechanical Wuxing 5 Star branded four-finger brake levers with motor inhibitors, which cut power to the motor when squeezed so you’re not fighting the motor when you need to stop. This feature is especially important considering the high power output of the motor! 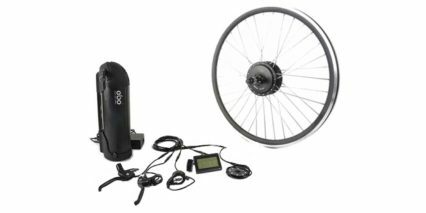 The brake levers are only compatible with mechanical disc brakes, but EBO offers a magnet sensor that can be glued onto hydraulic levers if that’s how your bike is setup. This is one of the bigger compromises for me, because I would definitely be running hydraulic brakes to handle the power and weight of a converted fat bike, and the magnet setup just isn’t as nice looking as purpose-made levers with integrated motor inhibitors. As far as settings go, you can lower the top speed to feel safer, make the throttle active in assist level zero so you can ride like a scooter, and enable cruise control for long commutes. By default, the bike is set to assist level zero, so that the throttle is inactive. Once you cycle up through the levels of pedal assist, you can throttle at any point to get started or push up a hill, but be careful because it’s hot and it does have a lot of power! As you can see in the video review, I tried this kit on the Surly Wednesday and it takes off pretty fast. 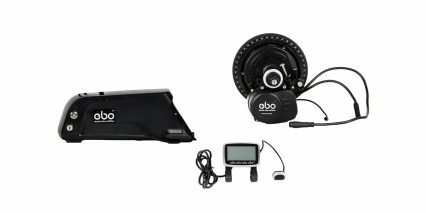 This was one of the fastest and most powerful EBO kit that I tried and I was impressed with the overall performance. To get riding, you mount and lock the battery to the frame, turn it on by pressing the silver circular button on the left side (which has a blue LED glow once activated), then activate the power button on the control pad by holding it down for a couple of seconds. At this point, the LCD screen (or LED console) comes to life. 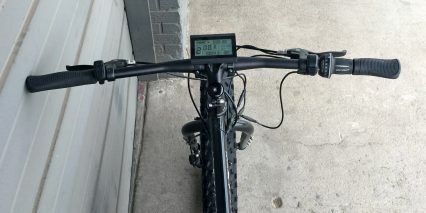 The default display hardware is EBO’s beautifully backlit LCD console with an integrated USB charging port, but EBO does offer to swap it for a more basic and possibly more durable LED console to reduce handlebar clutter. The LED pad is nicer than average because it shows a speedometer in addition to the current charge level and assist mode. Neither one of these two display panels is removable, but both can be swiveled to improve readability or reduce glare. The LED pad is a good option for people who want to mount their smartphone or Garmin front and center. The default LCD console has all sorts of menus, but is operated by just three buttons on a remote button pad within reach of the left grip. This control system combines simplicity with depth and is intuitive to use. Once you get used to it, you won’t need to keep looking down at the display. The power button in the center of the remote pad allows you to cycle through trip stats like odometer, trip distance, average speed, max speed etc. If you’re riding in darkness, you can turn on the backlight on the display by holding the up arrow. Holding the down arrow will activate walk mode if the bike is not moving more than 6 mph already. There’s a timer, a light, and a motor inhibitor indicator. There is a five-bar battery info-graphic, but you can also toggle through the settings to display the voltage level of the battery. I think this is important because the last bar could indicate any level from 0% to 20% and that can be a big difference when you need to know how far you can go before stopping to charge. The thing is, there’s no real guide explaining how to interpret voltage, it’s something you pick up as you go. The up and down arrows allow you to raise or lower the assist setting when clicked briefly. The default configuration is a 20 mph top speed with throttle override (at full power) in assist levels 1-5, but not zero. Once you arrow up to 1-5, the pedal assist sensor goes live and you can instantly use the throttle with full power as an override. Although it comes programmed with a top speed of ~20 mph, you can set the top speed even lower and you can make the throttle active in assist level zero so you can ride like a scooter if you want… Again, so many options here. The settings menu allows you to choose from Class 1 pedal assist (up to ~20mph), Class 2 throttle (up to ~20 mph), or Class 3 speed pedelec (up to ~28 mph). And, for high speed riding or adventuring, you can remove the throttle to ride as a Class 4 with a top speed approaching ~35 mph. 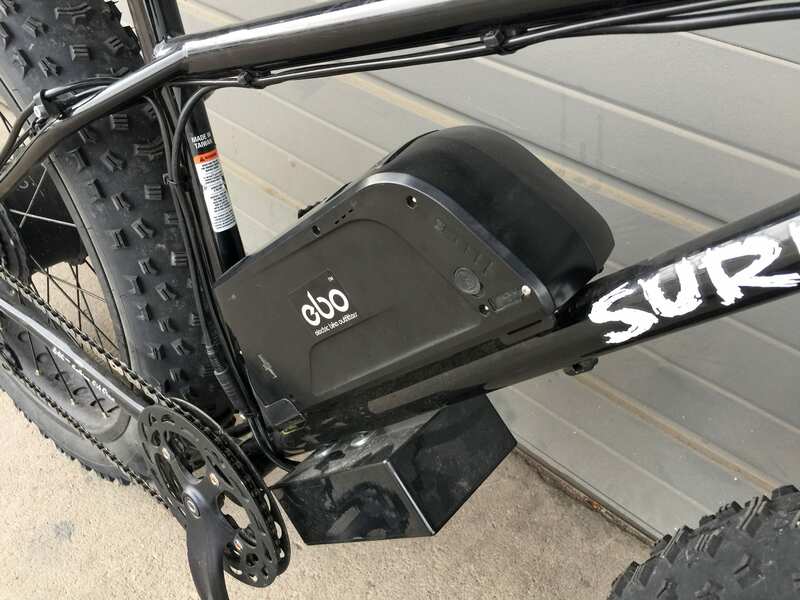 In this case, it’s almost a dirt bike and is not street legal, so it’s more suited for private property, forest, or logging roads, which is great since that’s ultimately what this kind of kit is intended for. I appreciate how the display that comes with this kit is so useful and that it allows a bike to be customized for almost any kind of performance. 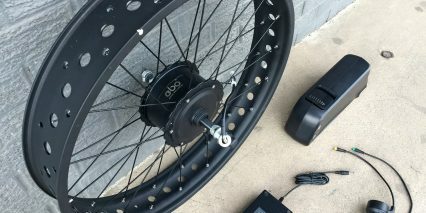 The Fat Tire Kit features EBO’s planetary geared hub motor, with a wider design to accommodate fat tire bikes. It provides better support for the wider rim by allowing for a wider spoke bracing angle. It’s built onto a 12 mm or 14 mm threaded axle with machined 9.8 mm flat cuts on each side, which fit into dropouts and pushes against the frame as the motor turns. This kit does come with a torque arm, which helps to spread some of that power out and limit frame damage. The aluminum alloy shell of the motor casing is tapered inward to avoid scraping the frame. 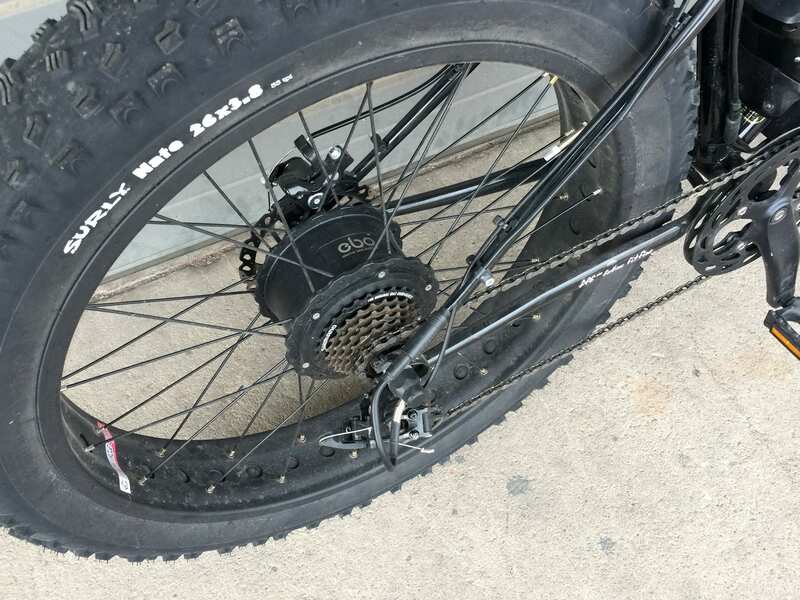 The double-walled fat bike rim has punch-outs to reduce weight and allow for more compression and comfort. 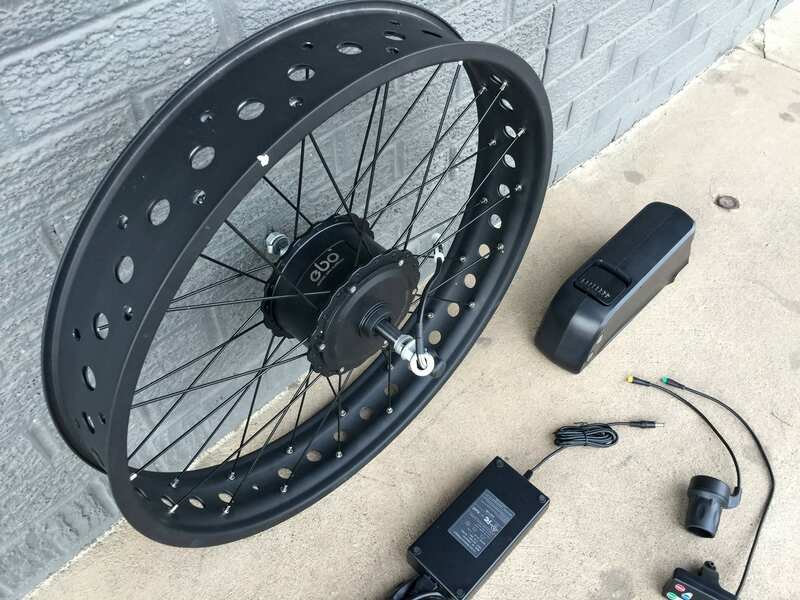 These wheels are hand-spoked with stainless steel, extra-thick 12 gauge spokes, and you can mount a disc brake rotor directly to the side of the hub. Jason unscrewed and opened a motor during the visit so we could look at the copper winding and planetary gearing inside. The gears were plastic, which is not uncommon for motors like this. I have found them to be very durable but also quiet and lightweight compared to steel or aluminum gearing. 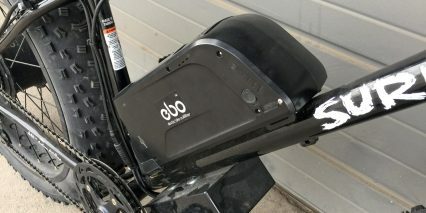 That being said, this is EBO’s heaviest motor (10.2 lbs total). The wheel is available in 170 mm or 190 mm hub spacing depending on your rear dropout width. It can be configured with a single speed, 6, 7, or 9 speed cassette or SunRace 8 and 9 speed cassette to replace your existing hardware. 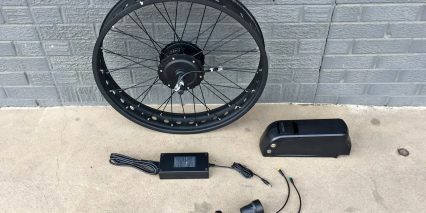 Hub motor powered ebikes tend to feel zippy and fun and they work well with throttles; they don’t require a custom frame design to interface, and aren’t as vulnerable to rock strikes as mid-motors. Because this motor can support such high speeds, the kit comes with an external stainless steel torque arm to spread the force of the motor and protect your frame and dropouts as mentioned earlier. You’ll have one additional cable to worry about (protruding from the right axle), and this is something to be very careful with. Try not to let the bike tip over and bend this cable or get snagged on foliage or rocks as you ride. If it gets bent or broken, it could mean the end of your motor. It’s a vulnerable point for most hub motor powered ebikes! The happy benefit of this drive system, however, is that it completely separates pedaling from the motor, and reduces wear on the chain, sprockets, and derailleur, compared to a mid-drive system. This makes it easy to shift gears and, when you’re coasting, it still freewheels efficiently. With this bike, I noticed just a little bit of drag from the fat tires themselves, as well as increased noise on pavement. The kit is powered by a Dolphin style Lithium-ion battery pack, made with Samsung 18650 cells. They’re configured as 13 in series and 4 in parallel to offer 48 volts and 11.6 amp hours (though Jason advertises 11 to set expectations more realistically). So, the battery pack itself is relatively lightweight at ~7 lbs and it interfaces with a plastic slide which you need to screw onto your frame somewhere. 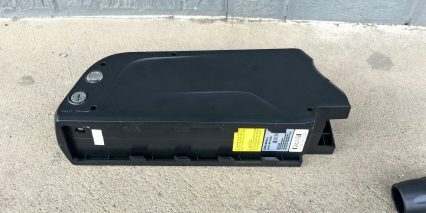 There is a sturdy metal track inside the plastic slide, with long slots for inserting bolts. Ideally, you’ll be able to mount this to bottle cage bosses on your downtube. It positions the battery weight, low and center. Lithium-ion cells are known for being relatively lightweight but very durable and long lasting. They don’t develop a memory if you forget to charge them right away, but they are still heat and cold sensitive. Jason recommended recharging after the pack had been depleted to around 20% vs. recharging after every short ride. He explained that this would allow for more full cycles, and help the cell chemistry last longer. However, if you go below 20%, there’s a chemical change in the batteries and this could be hard on them. 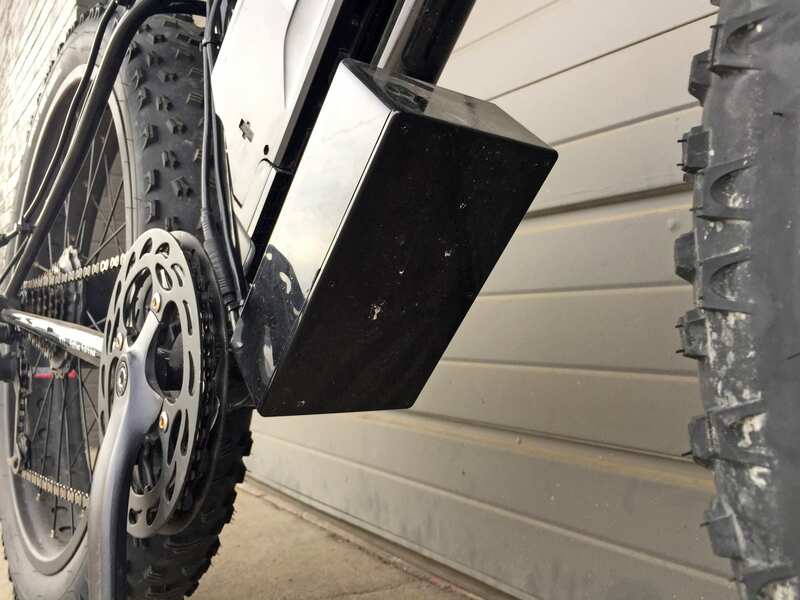 It’s best to store the battery pack in a cool, dry location, and you can charge it either on the bike frame or off. It locks securely to the frame but has a hinged handle on top for safe lifting and carrying. I do have a few gripes about the battery pack, and the first one is that the slide mount only attaches with two bolts in most cases. Compared to purpose-built e-bikes, it’s just not as sturdy or nice looking (newer bikes have batteries that are sunk into the downtube a bit for even lower weight and sturdier positioning like this). The battery has three ports in the right side (a fuse, charging point, and USB port), and I found the rubber charge port cover a bit tricky to seat properly… I had to be intentional about lining it up exactly before pushing in with some force. The USB port on the battery is disabled to reduce phantom power draw, but remember the display unit has its own USB port for charging phones, etc. 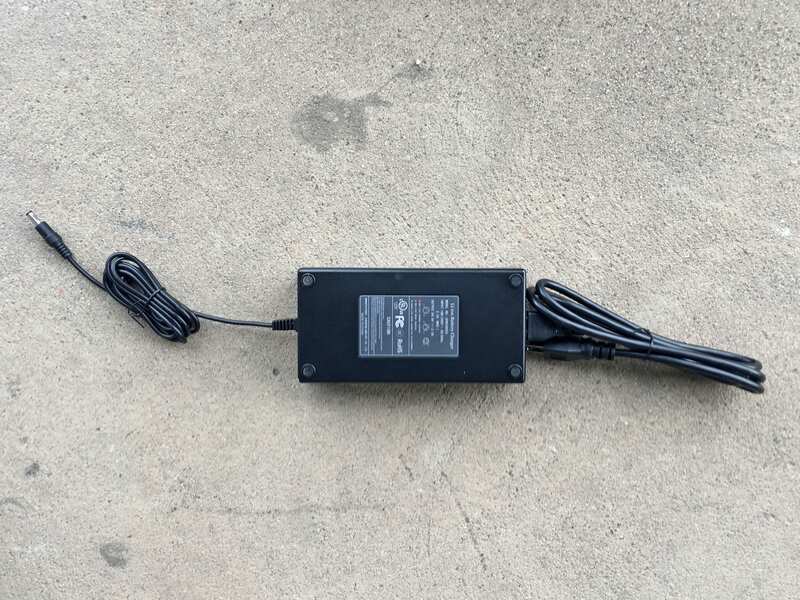 The battery charger itself is kind of generic, providing 2 Amps of power output for regular charging speeds, and it’s not super compact or lightweight at ~1.9 lbs, but is still small enough to toss into a bag and bring along on rides. Another thing to keep in mind about the battery pack is that you have to turn it on independently from the display, and this takes a few extra seconds. The time isn’t such a big deal, but you also have to remember to turn it off after each ride. And, if you hop onto the bike before turning the battery on, you might have to bend way down or twist in an uncomfortable way to activate it. This isn’t a big issue, and one that isn’t unique to EBO kits or even purpose-built electric bicycles, but one worth noting. Perhaps the biggest gripe about the battery pack isn’t the pack itself, but the fact that the controller unit is not integrated. This means that you’ll have to find a second mounting position with two more bottle cage bosses. There are aftermarket products like the SKS Anywhere adapter, but the great thing about the Surly Wednesday is that it already has additional bosses along the bottom of the downtube. 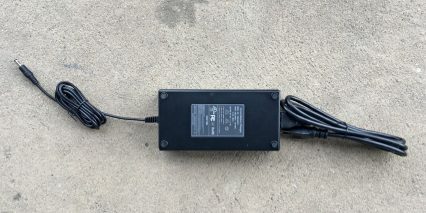 The controller is much lighter than the battery pack and Jason could probably guide you on what has worked well for other customers in terms of mounting. 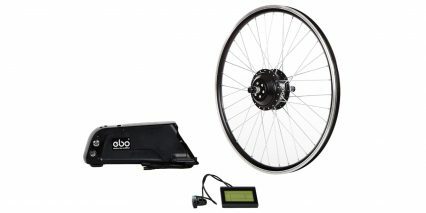 The Fat Tire kit comes with EBO’s cadence disc, which uses eight magnets (unlike some other kits out there that have 6 or 12). Jason assured me that eight is enough to make it responsive because the disc has a smaller diameter, which also makes it less likely to be bumped. 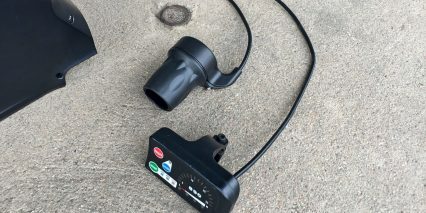 He explained that some customers have purposefully lowered the sensitivity because an accidental partial pedal stroke could unexpectedly engage the motor. Unfortunately, the cadence sensor is one of the more difficult parts of this kit to install; it requires a bottom bracket wrench since you have to take off the crank and slip the the sensor and magnetic disc over the spindle. A lot of us would need some help from a shop to get it on. While it’s not a quick and easy clip-on design, it should be more stable and reliable for rugged off-road use. 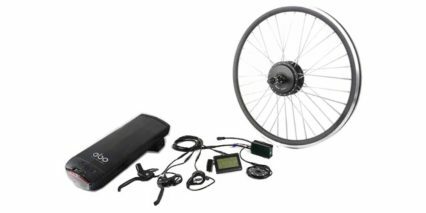 With this fat tire e-bike kit you’re getting EBO’s proven hardware – the smooth-operating geared hub motor, the extra powerful 30 amp controller, and water-resistant color coded Julet connectors. The display may not be as fancy as some of the newest available technology, but it gives you tons of options for how to operate it. 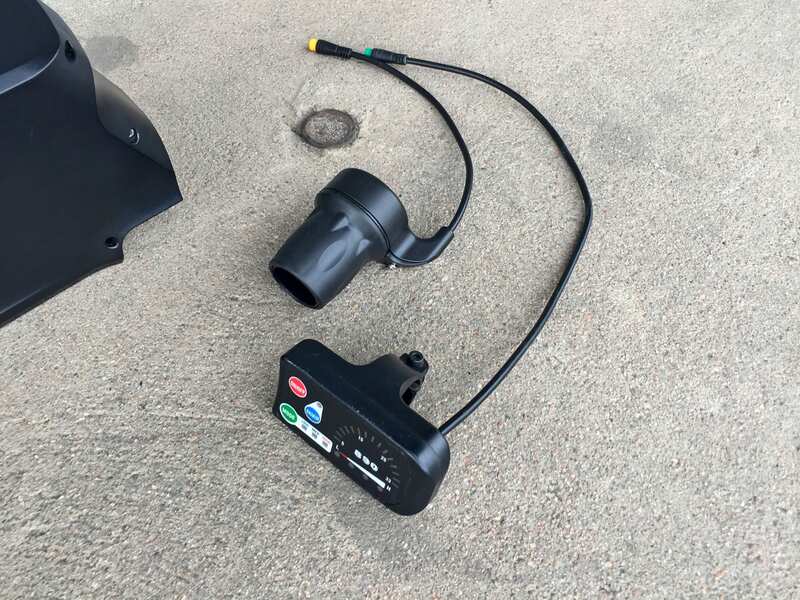 Even though cadence sensors are known for producing more of an on/off feel, the motor has been designed to ramp up smoothly, so it isn’t jerky or startling. The control systems are intuitive, but deeper than normal, and not locked. Whether you’re riding in bright light or darkness, the LCD should be viewable, because you can activate backlighting. 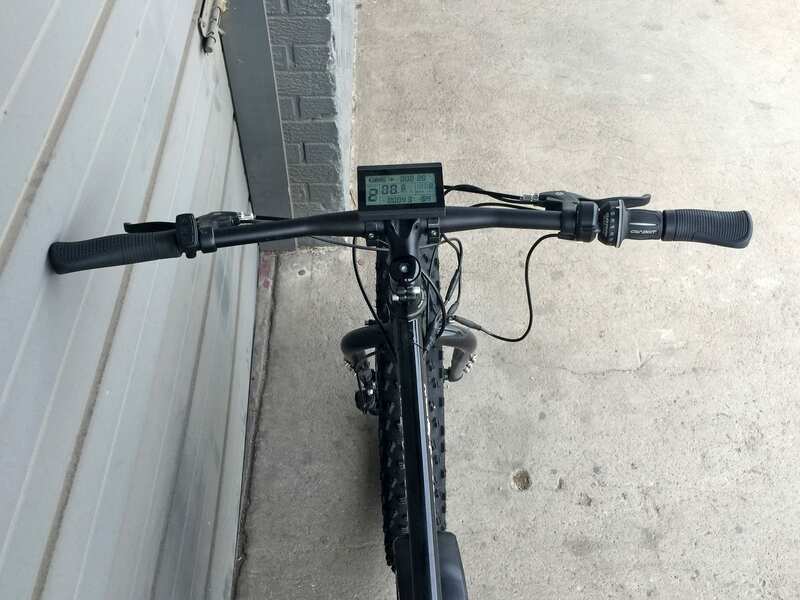 The display is not limited or locked up like most purpose built ebikes and it gives you USB power for maintaining a phone or GPS while you ride. I should point out that the display does seem a bit vulnerable for rugged trail riding and off-road use, but it’s versatile overall and features a lot of useful options for a variety of applications. I can certainly see how the throttle override would be a helpful option for getting started up steep hills or traversing patches of sand or snow. 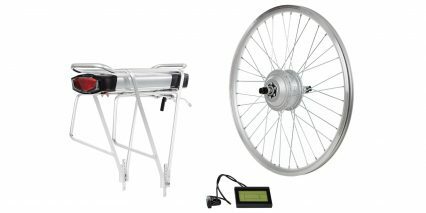 In short, I think this kit is a winner for those who are looking to get maximum power and speed out of their fat tire bikes for trail riding, bikepacking and trekking through varied terrain. If you’re loading up for a camping trip, it’s more than capable of carrying that extra weight. 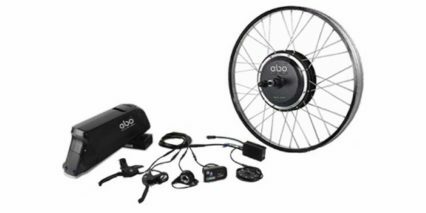 And with a range of 20 to 45 miles from one charge and a sweet cruise control feature, this kit could be used for certain types of commuting, too. It’s good to be aware that the distance you can get from one charge varies depending on the intensity of the terrain. Riding through deep snow or climbing mountains, for example, may shorten the range you can get out of one battery. For long overnight treks you may want to carry an extra battery or a solar panel charger. Another range-extending option is to daisy-chain packs and you can actually accomplish that with this and other EBO kits! 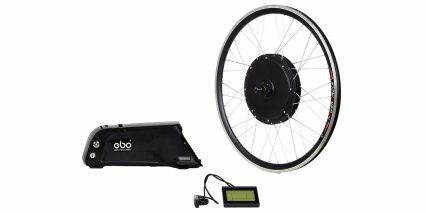 I saw a really cool setup on a recumbent trike with two batteries being built with the 48 volt Burly kit on a recent visit to EBO’s shop. Jason has personally edited and clarified the online manual so you can confidently experiment with the many options and settings that are available. A lot of times with kits, you’ll have to interpret limited instructions… so having a good manual and phone number to actually speak with someone is worth a lot. In short, this kit will transform just about any fat tire bike into something with a lot more power and versatility. I found that it was extremely fast and powerful on flat pavement for my 135 lb body weight. I definitely prefer the nimble feel of geared hub motors to gearless (but EBO does offer one of those too), and I like the way this one gets up to speed quickly yet smoothly. Big thanks to Jason and his team for hosting me and partnering with me on this review. He is expanding in a way that seems sustainable, definitely growing, and I love that his support is still above average for the industry (at least the kit industry). It’s part of the slightly higher pricing, and also what makes dealer sales possible. I was impressed to hear that several Denver area shops actually carry his kits and offer them as an alternative over purpose built products. There’s something to be said for recycling an existing bike, breathing new life into an old favorite, or building a truly custom setup that isn’t available anywhere else. 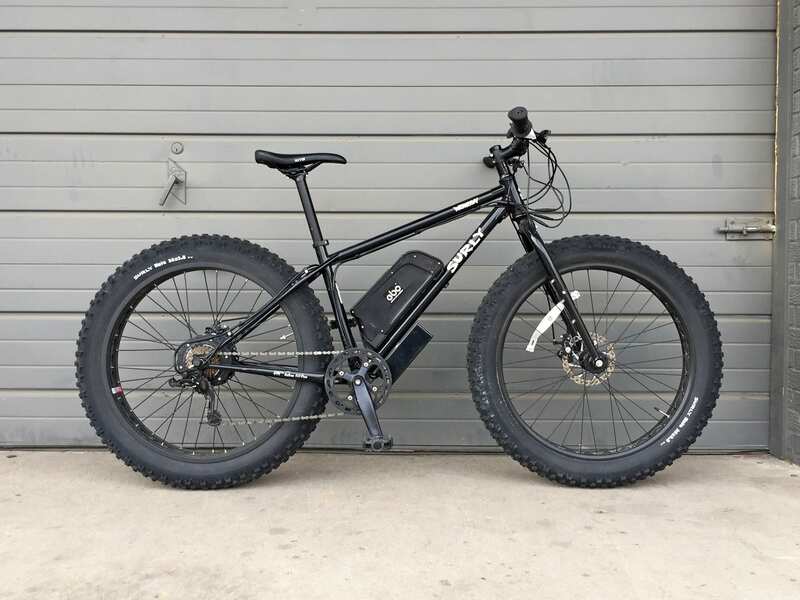 Being able to transform a fat tire bike into an electric with multiple drive modes and higher speeds like this for just over $1.6k seems pretty good to me; there are cheaper kits out there, but most of them don’t offer this level of performance or support and this is the only one designed specifically for fat tire bikes! You can activate walk mode to help move the bike by holding the down arrow if it is standing still; if you enter into the menu settings you can activate cruise control and then when riding over 6 mph, hold the down arrow for a few seconds to set cruise speed; so many options! When you can buy a Bafang center drive system (motor, display, battery, etc. 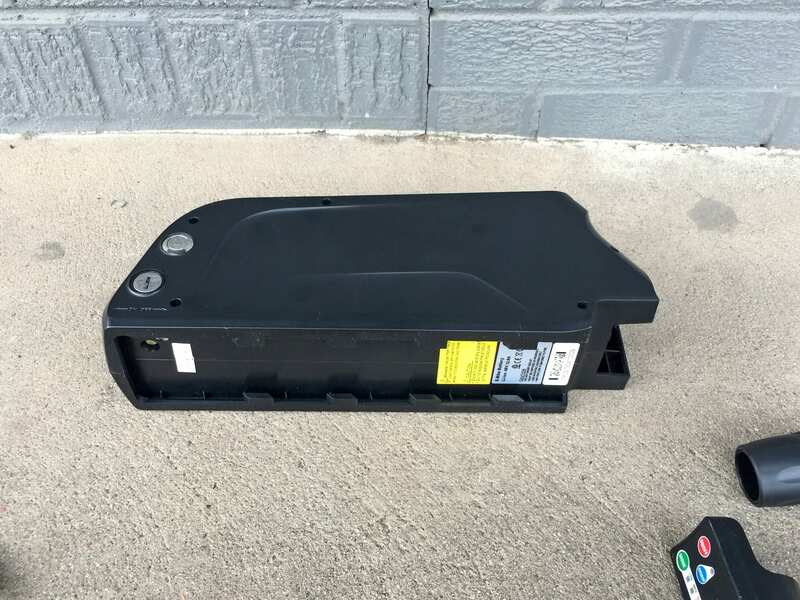 ), BBS02 750w for $700… you would think you could find a 36V 350W Motor, 36V 11AH kit for $400 or so. $1000 for this kit from EBO. Nope. Sweet, thanks for sharing the details Jeff! Glad you’re enjoying it. Do you have any feedback about how it arrived, installation tips, or any differences between what you got and what I reviewed here for the EBO Ft Tire Kit? I was really happy with this Bafang BBS02 kit from Bafang USA Direct. Affordable, powerful, basic mechanic skils to install. I recommend it. 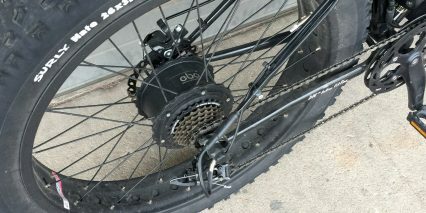 Jeff, Did you actually install the Bafang BBS02 kit on a Fat Bike bottom bracket? On bafangusadirect.com they don’t seem to have a 100mm kit. The one they show for $799. is not for a fat bike.